Nutmeg Soaring Association (NSA) - Soaring since 1956! Originally founded in 1956 in Connecticut (Nutmeg is the Connecticut nickname), NSA is looking for enthusiastic new members ages 13 and older . We are a private, volunteer, non-profit organization dedicated to teaching and enjoying the art, science and safety of flying sailplanes. Many power pilots find soaring not only a challenging diversion but an exceptional opportunity to sharpen their existing skills. We also offer ground and flight instruction for transitioning power pilots. Flight operations are every weekend mid April through early November with an encampment the week of July 4th. During the encampment week we fly from Saturday to the following Sunday. Many Saturday mornings one or more of our instructors can be found leading a ground school. All are welcome as safety and pilot readiness are our highest priorities. 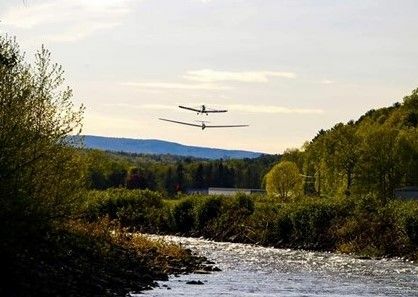 Set near the idyllic Catskill Mountains and adjacent to the beautiful Catskill Creek, the Freehold Airport is owned and operated by Nutmeg Soaring Association Members. The NSA owns ten aircraft hangars, two Tow Planes and four sailplanes, two of which are high performance models. There are 22 campsites with electricity available to members. For those who fly in for a weekend visit, tie-downs are available on the field. A bunk house and showers afford visitors and members comfortable overnight accomodations. A fully equiped kitchen and pilots lounge/club house are a favorite locale for social events after the days soaring is done. When a warm summer afternoon comes to a close, many members, friends, and extended family enjoy swimming in the Catskill Creek before the evenings social activities begin. Demo Rides available for $139. Weight limit 242 lbs. Our airport has a 2275-foot long blacktop runway, with a 600-foot over-run at both ends. With the northern Catskill Mountains and Windham High Peak 5 miles southwest and 3550 feet in elevation, we frequently enjoy thermals and wave, keeping us aloft even on days when other area gliding sites are on the ground.